Over Summer 2015, I worked for the User Experience Design team for Teradata, a global enterprise software company. During my internship, I worked on 2 different marketing software products- a workflow management software for large enterprises called Marketing Operations (Marketing Ops) and Digital Marketing Center (DMC) solution which is a cloud-based, all-in-one digital marketing hub that enables marketers to communicate digitally with customers. This project focused on Marketing Ops. I worked with a global team on this project. Workflow software for enterprise can be complex, the need for task management and reviews is a lengthy and arduous process. Oftentimes, the effort of setting up projects, regardless of campaign size is monumental. In our jobs we know that things come up, and workflows change. What if workflow software was agile, flexible, and easy to set up? My overarching summer long project for Teradata involved designing a simple way to insert a quick project into our pre-existing marketing software-The Simple Project. Update: This project will be implemented soon! Workflows aren’t visible and often times stored in different applications by marketing teams. Marketing Ops is too complex for mid-markets. Marketing Ops is designed for heavily regulated businesses. Making simple changes require arduous efforts. Through Stakeholder Interviews, it was apparent that marketing teams use different software for different aspects of projects. Visibility across teams and projects was virtually non-existent. Additionally, progress as well as roadblocks were not apparent in the system or were shown only after the project completion. I explored previous concepts and realized that previous designs included the basic Kanban board but lacked interactions that tapped into user needs. I conducted a competitive market analysis on collaboration tools including Basecamp, Trello, Jira, in order to understand their frameworks. Through the 7 weeks of this project, I worked with marketers and product managers to interview SMEs and to further iterate on designs and interactions. This was my timeline for this project. It helped me to evaluate my goals for each week and adjust as necessary. By having a visible action plan, it helps everyone onboard to stay focused. This visualization represents the ideal flow for a “simple project”. The information was synthesized from interviews with SMEs and Project Managers. This flow provided the basic framework to start sketching some initial designs. This visualization identifies the roles within Agile Marketing Teams. The purple dotted line represents the interactions of users in either the micro (bottom) or macro (top) view. This view provides drag and drop cards so collaborators may view and report their progress providing for quick feedback and transparency among various roles. 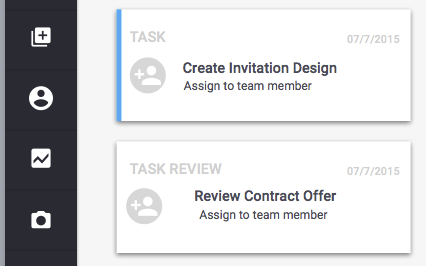 Each card includes the task title, due date, person assigned to task thereby increasing transparency between users. -Agile process allows marketers to test multiple campaigns and projects faster. -Needs can change, and so should projects. Marketing Ops software is currently too rigid to allow quick changes. -Visualizing progress and potential roadblocks creates transparency across teams and managers. Collaboration: I partnered with 2 Product Managers and researched the Teradata Marketing team's use of the Agile process in order to validate and test my research. The opportunity to work with SMEs helped to further conceptualize scenarios and personas. I interviewed and conducted usability testing with marketing teams. Sought feedback from visual and ux designers, engineers, project managers, and marketers. What I learned: This project taught me to never stop asking questions. Passionate designers are inquisitive, and asking thoughtful questions uncovers so many embedded yet meaningful interactions. This opportunity not only helped me hone my love for pixel perfect design, but consistent and thought provoking feedback helped me to wade through the swamp of enterprise. What I found challenging: I wanted to explore every single interaction that I could possibly find within this system...in 7 weeks. I designed what felt like and probably was a 100 different flows for various things. Having other designers to give me honest feedback helped me look deeper into the interactions instead of breadth. Wireframes: View full wireframes here with password. Thank You: Special thanks to my design mentors: Anna Eaglin and Anthony Hatfield, your leadership and thoughtful critiques are an inspiration. Thank you to the UX and Visual Design team, the weekly design reviews helped me grow as a designer and thank you for always asking questions!